The gift that will be both a pleasure to give and receive. And so easy! Simply fill in the form below or call us at 1.800.662.5723. 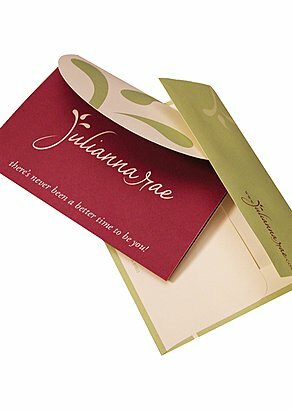 Your gift card will be beautifully presented on our signature card and envelope. In a pinch and need it right away? Send an eGift Card! Out of time? If FedEx can get there overnight, so can your gift card. Just select Overnight Delivery during check-out. * Terms and conditions: There really aren’t any except one - it is non-refundable. However, it never expires. It may be redeemed online or by telephone. And it is fully transferrable.